Followers will regard every post you share as a “recommendation”. If they like what you recommend, they will react with likes, comments. In the best case, they will share your posts with their followers and this will extend the reach of your posts. Alternatively, you can also present curated content in a timeline or a chronical order. This approach is particularly suitable to reflect the evolution of an idea or to show the development of fast-moving trends. You can show to your readership that you are both up-to-date and have sound background knowledge of historical facts and developments in your industry. Content distillation means you not only share information, but you also summarize your curated contents. By creating a distilled summary of the content you bring the content into a more simplistic format to get down to the basics of the information and highlight core statements. By filtering content, instead of simply aggregating content, you share only content from those resources that are most relevant and valuable. Filtering content can also be used to draw attention to specific news and events in your industry. If there is a study with new, interesting results, you can also curate this information as “snack-size” content, f.e. as share pics or memes. Like with content distillation, content elevation refers to a more analytical and sophisticated approach to curation content. You not only share content, but you provide an extract of information with a mission to identify a larger trend or insights in the information cluttered world. Another popular type of content curation is the mashup. In a mashup, like distillation, you summarize the basics of your curated sources. But you not only research different perspectives on a specific topic, but you also draw a conclusion and add your own point of view. This method is a good way to start a discussion with your followers on a controversial topic. For brands and organizations, content curation can help to capture attention for information on a specific area of expertise. In the era of information overload and content shock, people tend to look for sources of information they can trust. A well-curated content stream can help to provide the most relevant information your target audience is looking for and thus become a trustworthy resource, they are likely to follow and engage with. Content curation can thus help to establish a brand reputation and thought leadership. In corporate communications, Content Curation can be used as an essential element in creating a valuable content mix for customers and followers. The key principle of becoming a good curator is knowing your audience, identifying a specific area of interest, and consistency in providing fresh and relevant content. Content curation does not necessarily have to be an extra task in your everyday corporate communication but can also be a good basis for interesting discussions and engagement with your followers. An example from our Facebook group Blog2Social: Blogging and Social Media: In this group, we share posts about blogging and social media from a variety of internal and external sources. Creating high-quality content for your blog and social media channels on a daily basis is most challenging for every business. Curating relevant content from various valuable sources in your industry will provide a content consistency of fresh content for your social media channels. By curating third-party-content you can increase the frequency of publishing content while at the same time alleviating the pressure of creating original content with your own resources. You can stay in touch with your followers even when you don’t have any original content in stock. Curating content is not as time-consuming as content creation so there will be no need for allocating extra resources for this task. A social media channel with a consistent flow of relevant content and up-to-date news will ensure a better engagement with your followers. 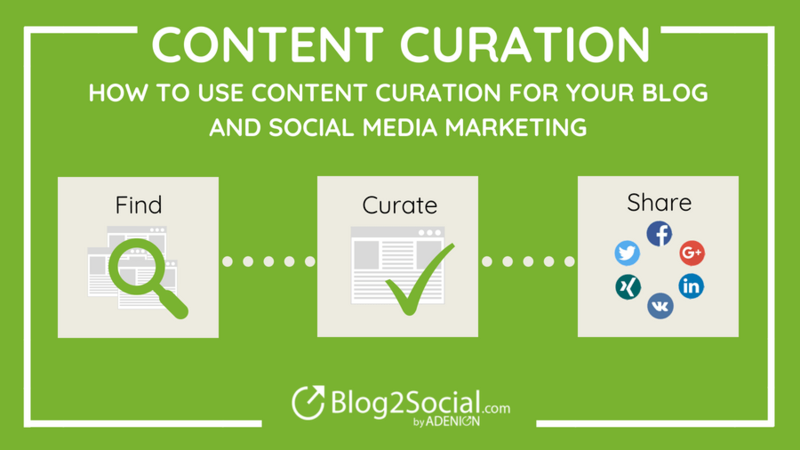 Content curation helps you to turn your social media channels into a go-to web resource. 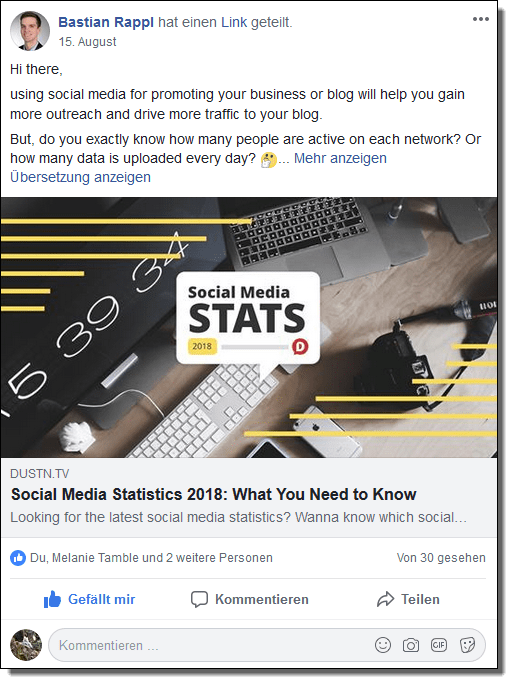 By regular posting the most relevant articles, infographics and videos on your topics you will develop your social media channels into an interesting resource for know-how and information. This will improve your credibility and trust. You can provide value by filtering the most relevant information for your readers, add your own ideas and conclusions and provide different points of view. By not only aggregation content, but filtering, distilling and a mash up of relevant information you can offer orientation in an otherwise information cluttered web. The social networks can significantly increase the reputation of a company, a brand, a product or a person. Content curation helps you to draw attention to your business or brand by sharing relevant information on current developments in your industry and position yourself as a trustworthy expert or company with expertise and know-how. By adding your own perspective to quality content from a variety of sources, followers will associate your channels with valuable insights and attribute this expertise to you, even if you haven’t created the information yourself. A perception as an expert and thought leader will increase your reputation. Your fans and followers will trust your statements and opinions in the information cluttered social media world. Social media content is not supposed to be only about you. Corporate communication that is self-focused will not engage followers. One of the top reasons people unfollow brands on social media is too much promotional content. Even if your content genuinely adds value, people can get annoyed by hearing only your brand’s voice. Curation content from a diversity of valuable sources will ensure a variety of contents, formats, and opinions. A diversity of content allows you to provide different perspectives and thus, make your timeline more interesting and engaging for your followers. Sharing is caring. By sharing content from other, you show that you care about their expertise and opinion. Curating content from established opinion leaders and Influencers in your industry will help to spark influencer relationships. By sharing social media posts from influencers, quoting and crediting them by including @handles, you can draw their attention to your person, blog, brand or business. This will help you to engage with them. Promoting influencer posts can be a starting point to establish a long-term beneficial influencer relationship. By means of curated contributions, you can analyze which topics, formats and types of content work best for your community. If a curated post gets a particular amount of likes, comments, and shares, this will show you what your community specifically likes and is most likely engaging with. This will give you valuable ideas on topics you can follow up or formats you can adapt for your own content. The analysis of your communities engagement with curated posts can be a valuable source of inspiration for your own content creation and will help you to produce even more engaging original content. In any case, curated contributions are an exciting test field for you and offer inspiration. You get new contacts, fans, and followers through interactions of your community. High-quality curated contributions from third parties can, therefore, help you to get more fans and followers and build your social media channels. A larger community means more activity on your channels, which increases the visibility and reach of your social media. A positive spiral that you can accelerate with Content Curation. Content curation not only bridges gaps in your own skills and knowledge, but it has also an educating effect. By researching, reading, sorting, distilling and commenting on curated content, you will add to your internal knowledge base of insights in current trends and industry know-how. This will keep you and your team informed on latest trends and helps to add value and ideas to your own content creation and production process. From each curated piece of content, you will take-away at least bits of information and know-how about innovations, other opinions, and different perspectives. Thus, content curation will automatically help you grow your own expert knowledge and always keep you up to date. 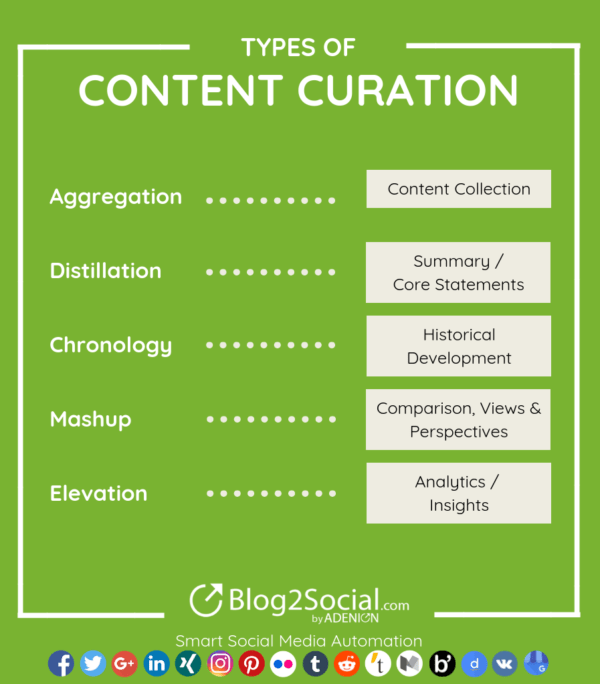 Content curation actually covers more than just sharing information. It requires “shared value” by providing a context to the shared piece of content, by commenting on it and adding your own thoughts and perspectives, praising or criticizing the author, or by highlighting a core statement. By mixing your own original content with posts from a variety of sources you add a diversity of information and perspectives to your topics. Commenting on your curated posts will not divert your followers’ attention but encourage them to share their own thoughts and perspectives and thus, stay or come back to your streams. The main purpose of curated content is not just filling your editorial gaps. 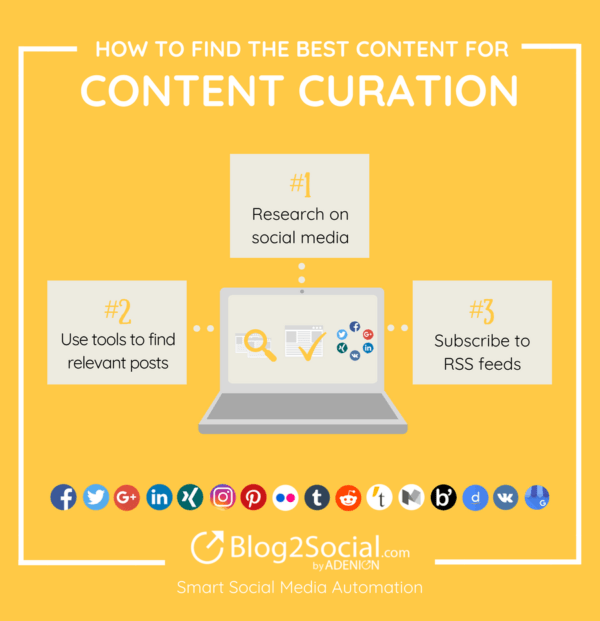 Content curation aims at presenting a selection of high-quality information that gets to the essence of what your followers really want to know. Select your sources carefully. Assemble the top content you can find on your topics. Comment on your curated posts to give context. Add your own thoughts to engage your community. 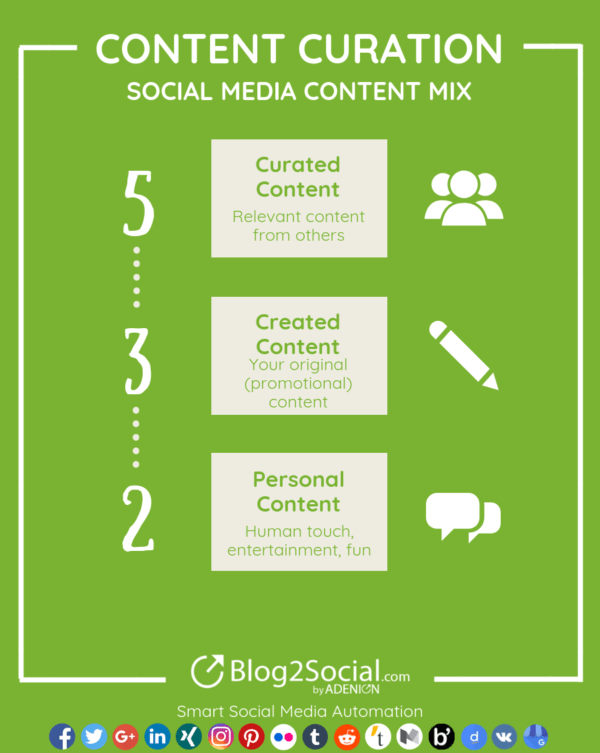 Curated content is not a “one-size-fits-all” for all of your social media channels. The type of content and method of content curation that suits your content strategy and channels depends entirely on your individual situation and on what works best for your blog, business or brand. Facebook thrives on curated content. Content curation works on private profiles, on pages as well as in groups. On Facebook, content curation is simply a mandatory strategy. The microblogging network has even invented a new term for content curation: Retweeting. With a retweet, you share tweets in your channel. Curating content from and for your peers, clients and business partners is also common practice in the international LinkedIn business network. You can also curate foreign language articles. The network is also a major network for sharing and curating content for corporate communication and networking. In addition, Google+ communities offer the opportunity to reach targets with specific interests outside your own contact circles. On Instagram, you can add other Instagramer’s posts to your story with a single click. Always remember to use #hashtags in Instagram posts, even for curated posts. Pinterest mainly works on content curation. You can collect and pin posts from other Pinterest users and sources on your pinboards. Reddit gives you the best of the internet in one place. By curating quality content you increase your Kharma to get a better visibility and reach for your own original content. By adding your own comment and perspective, your curated content will become an integrated element of your own content strategy. Tell your followers why you are sharing this piece of content and why you think it’s worth reading. By praising or even contradicting the shared ideas you show your expertise on the topic. Personal comments will make your curated posts more engaging for your followers to comment and share their own opinion. In many social networks, crediting is quite simple by including a via @handle in your comment. By tagging and crediting the source, the author will be informed of your post. Everyone likes to see that their posts are shared and many will react with a like, a thank you, or by actively participating in the discussion. Thus, crediting important influencers in your industry can be a good starting point for beneficial influencer relationships. 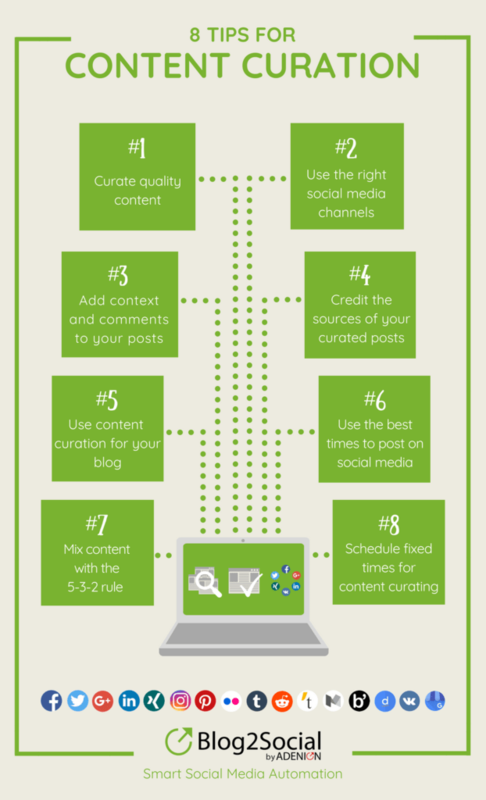 Content curation does not only work for your social media marketing, but also for your blog. Leveraging third-party content can add value to your own original blog post and fill gaps in your editorial calendar in times of lacks in creativity or a writer’s block. Every network has its own rush hour for traffic and engagement. 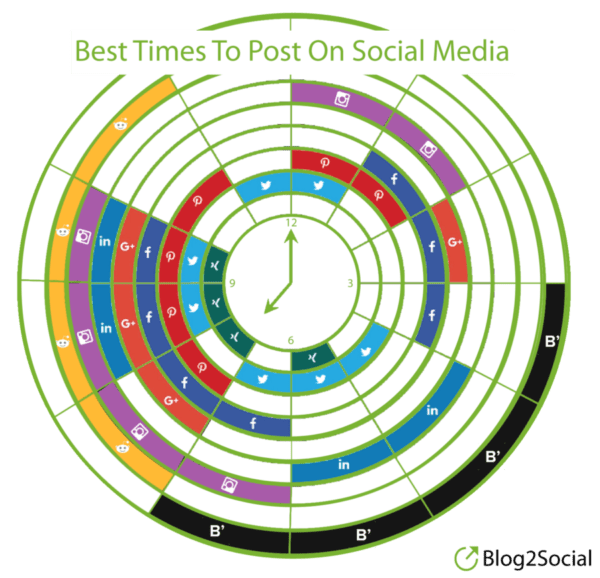 In order to reach as many readers as possible across different networks, it is advisable to schedule your posts at the best time to post on each network and each community individually. 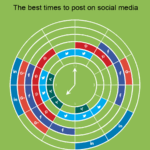 Your targets will not be at the same time in every network, so scheduling your posts at different times across multiple networks increases your chances to reach more targets and get more likes, shares, and comments. 2 pieces of personal content: these can be fun and entertaining contents or also very personal comments and statements. Content curation is like sports. You know you should do it, but you will always find an excuse due to a lack of time. However, consider content curation as a vital element of your content marketing strategy. Content curation can boost your marketing success. Allocate time for your content research and digestion on a weekly or daily basis. This will ensure to fill your social media channels with a consistent flow of fresh and relevant content. The news aggregator Feedly is available for various web browsers and mobile devices with iOS and Android and as a cloud-based service. Feedly compiles news feeds from websites you subscribe to. The former “Read-Later” app Pocket was founded in 2007 and allows you to store articles, videos, and other contents you find on the net. Any content can be sent to your pocket lists from your smartphone, tablet or computer – even per email. The Pocket browser extension helps you to quickly collect and save what you stumble upon. You can save articles to read and curate later. Scoop.it makes it easy to find and curate interesting content by specific topics and keywords. With Scoop.it you can add your own sources via URL or RSS feeds. With up to 8 million active users and 750,000 active bloggers, Bloglovin’ is the leading online platform for readers from North America and Europe. Bloglovin’ was first launched in 2007 as a blog reader offering a wide range of topics from fashion, beauty, and lifestyle to interior design and healthy eating. The Blog2Social Social Media Poster can be integrated into Chrome and Firefox and allows instant sharing of web content to Facebook, Twitter, and LinkedIn. You can also add a comment to your posts. Don’t panic, even for the following steps, there are tools that help you with your tasks to save time and work. 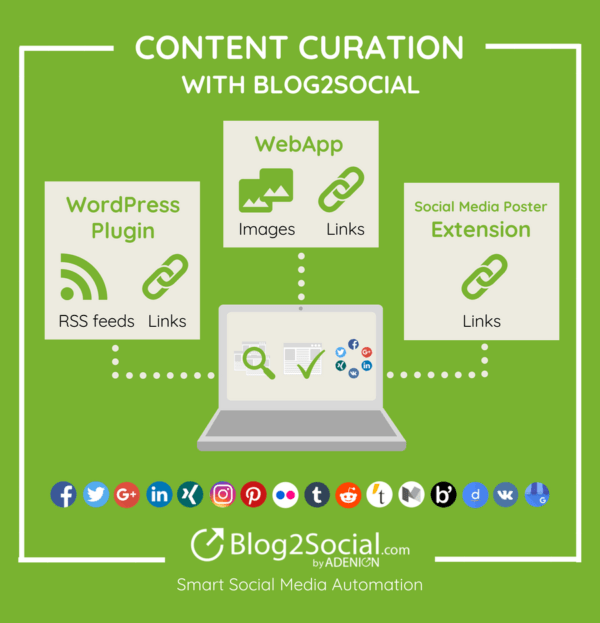 Content curation features allow you to customize your posts easily, to schedule and share your curated posts, to mix them with your own content, and to keep track of your shared posts. Let’s take a look at the Blog2Social social media automation tool. Blog2Social helps you organize your complete social media content planning, customizing, scheduling and sharing directly from your WordPress dashboard. This includes customizing, scheduling and sharing your own blog posts as well. Just copy the URL of the selected post into the “Content Curation” section. Share immediately or customize and schedule your curated posts with more advanced customizing options. With the “Customize & Schedule” option, a one-page-editor will display a preview of your post for each of your selected social media accounts. You can add an individual comment, select a post format, change the images, and schedule each post individually for each network and community. This option will turn your curated post into even more personal and engaging posts adapted for each social community. Excellent article on curation… Content curation is widely recognized as an effective tool to engage with online audiences more consistently. 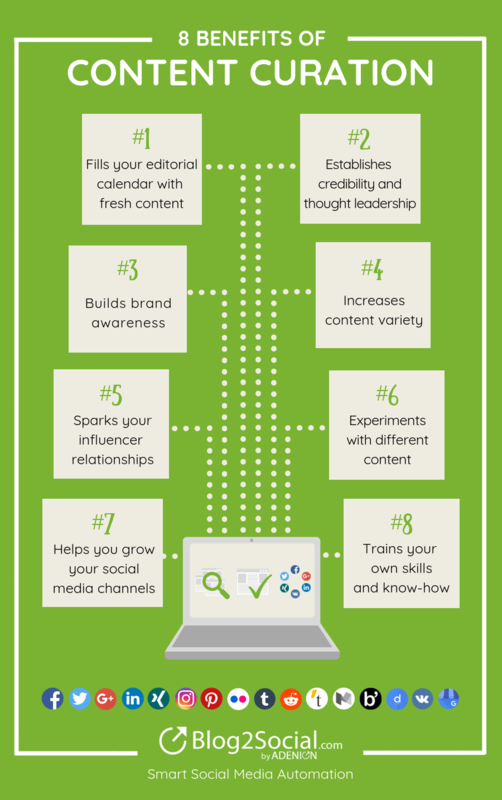 The benefits given by you will be very useful for a content marketer. And the most important key point I like is that use the right social media channels for content curation. Thank you for your feedback, Sarah. I appreciate it. Glad that you like it. Thanks!